At least 60 environmental services staff members at the new Gosford Hospital Tower reportedly walked off the job on May 29. The HSU has been in fortnightly discussions with NSW Health about the Gosford Hospital redevelopment since February, regarding the delivery of 18 new environmental services staff, which have not yet been delivered,” said Mr Roberts. According to Mr Roberts, staff shortages in the environmental services department had become so severe that basic tasks such as room refreshes were at times taking up to six hours to be completed, and patient care was being compromised as a result. Another major concern raised by Mr Roberts was the training and safety of environmental services staff, which he said, prior to the action, was lacking, with many staff members entering the new facility without having completed their basic safety inductions. “This became a major issue for environmental service staff when a fire in the new facility occurred, and some environmental services staff did not know the evacuation procedure. “If it had been a more serious incident, they could have been at significant risk,” Mr Roberts said. 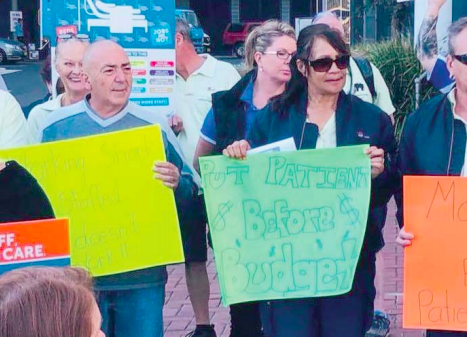 “I am pleased to say that since the stop-work meeting, the Central Coast Local Health District (CCLHD) and NSW Health have made preparations to address staff shortfalls,” Mr Roberts said. According to Mr Roberts, the HSU has had reports of environmental services staff having to work shifts with upwards of six to seven vacancies at any given time. “We’re still in discussion about potentially more new staff, and I hope the CCLHD comes on board to support their own people,” he said. Ms Tesch said she sympathised with the hospital staff and understood their frustration during this difficult transition time. “There are always going to be challenges when moving into a new facility,” Ms Tesch said. “Our health personnel do a fantastic job and we are still receiving positive patient reports regarding the new hospital. “I am aware that the CCLHD are delivering the equivalent of 11 and a half new full-time positions in the environmental services department and it is unfortunate that this stop work action has occurred. “This action is a result of a lack of communication, and I’m sure that as new staff commence, and existing staff settle into the new facility, the quality of the CCLHD’s operations can only improve,” Ms Tesch said. CCLHD CEO, Dr Andrew Montague, said the issues identified by environmental services staff had been resolved. “The HSU wanted more staff and we have delivered the equivalent of 11 and a half full time positions. “We also have another seven positions coming on board soon,” Dr Montague said. According to Dr Montague, the CCLHD has been working closely with staff and NSW Health to address the concerns raised during the stop-work meeting and said many of the complaints that the HSU brought to the media were not facilitated. “Our people are still getting used to our new facility. “Staff, including environmental services, were moved into the building in a staggered approach and this meant that not all of our personnel received their training at the same time. “We have 235 environmental staff, and 227 of them have completed their inductions and evacuation procedure training. “Those unaccounted for were either on leave or not rostered on when training commenced. “All in all, we have a 90 per cent compliance on fire training just for this area,” Dr Montague said. “Our staff were made aware that there would be growing pains as we transitioned into our new building. “This has always been the case since we started transitioning staff in April,” he added. In regards to Mr Roberts’ claim about the six-hour room turn and other duties being impacted in the environmental services department, Dr Montague conceded that some tasks did have longer execution times since the move into the new tower, but he denied they had been impacting on patient care. “I admit that one room turn did take six hours to complete, but this was an isolated incident which resulted from human error not a staff shortage. “The room in question had not been added to the log and was subsequently skipped during the normal procedures. “It was not the result of a staff shortfall. “Other tasks have been taking longer as staff adjust to their new workplace, and as they become more familiar with their surroundings, we expect timing will improve, but again this is something we anticipated and have discussed with staff prior to the move, so for the HSU to bring this to the media under the guise of a strike and a staffing crisis is very disappointing,” Dr Montague said. “We normally have a very good working relationship with the HSU, but in this instance they have stepped over the line,” he said.